David Suzuki, talking geology, we assume. David Suzuki makes some people cringe. These days, he is outspoken and sounds irritated, if not angry, about issues that matter to him – particularly the environment and Native rights. Dr Suzuki, a geneticist and entomologist, was arguably the world’s second most popular science guy back in the 1970s. (First place was Carl Sagan.) I watched Suzuki (I was a kid in those days.) whenever his Nature of Things appeared on the family tube. He taught this farm boy about nuclear energy, Lynx cats, genetics, and neutrinos. His topics became more controversial and included the downside of marijuana, genetic engineering, and last year’s story of his mother and Alzheimer’s disease. At age 78, Suzuki shows no signs of suffering from that illness; nor does he show signs that he is slowing down his incredibly energetic pace. Suzuki still lives and works here in Canada, mostly for the CBC, but also at his NGO, the David Suzuki Foundation. But over at the CBC, he recently hosted a great series called Geologic Journey, a look at how North America was shaped by plate tectonics and subsequent geological activity – the Canadian Shield, Rockies, Great Lakes, and so on were each highlighted. The programs are regularly repeated and still hold an audience of geologists in their seats. But even Suzuki’s science-geology series managed to be controversial, simply because it is about the nature of ancient Earth – a world older than 6,000 years. It still surprises me when I meet folks who want to argue for a young-aged Earth. A couple of nights ago, I ran into a kindly gentleman possibly of that conviction at a small gathering. Someone congratulated me on my latest book, The Mountain Mystery, and told me they were enjoying the read. Nearby, the kindly gentleman asked what the book was about. “It’s a science-history book, about how people discovered the way mountains were formed,” someone said. “Did you know that just 50 years ago, we didn’t know for sure what caused mountains?” The gentleman was puzzled. “I can tell you how mountains were formed, ” he said. “Glaciers. Glaciers formed the mountains.” I interceded and explained that glaciers certainly shaped the mountains – causing cirques and arêtes, bowls and ridges – but mountain ranges rose through plate tectonics. “No, it was glaciers.” He seemed quite certain, and he is nice fellow, so I didn’t pursue the topic. I don’t know if he thought that all mountain-making had occurred in the past few hundred years or past few million years, but I didn’t ask. In one world, the Earth revolves around the sun; in the other, the sun can be told to stand still in the sky (so that one’s enemies can be thoroughly slaughtered: Joshua 10:13). In one world, inter-species breeding is a disaster, yielding sterile offspring such as mules at best; in the other, the sons of god took wives among the sons of man and bore giants as offspring (Genesis 6:1). In one world, the Earth is clearly over four billion years old; in the other, it was created, as Bishop Ussher asserted, in the early evening before October 23, 4004 BC. Of course, we no longer hear much about the stalled sun revolving around the Earth or the gigantic grandchildren of gods. But the Biblical story of the young Earth continues unabated. Lately, however, I have seen a few refreshing websites and met a few thoughtful religious folks who tell me that they have no problem with the idea of a 4.3-billion-year-old Earth. I’ll point you to one such evangelist’s site: GeoChristian. I like that the website’s operator includes Geo in the name. I won’t try to speak for him – there are dozens and dozens of pages at GeoChristian that explain why belief and ignorance do not have to co-exist in the same body. 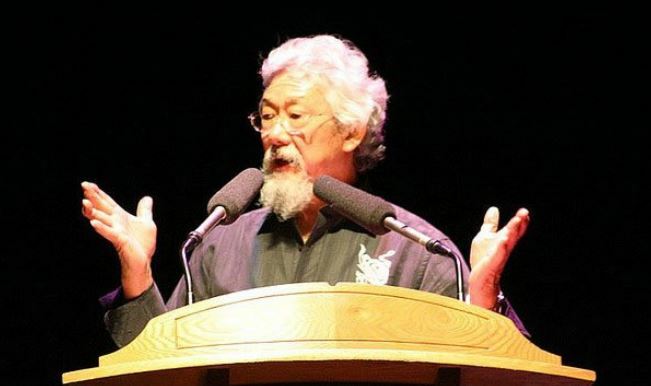 I began this piece with the much maligned David Suzuki. One does not need to agree with all of Suzuki’s contentions, but he certainly gives a person a lot to think about. And he has performed a great service by bringing science (and geology!) to centre stage in a colourful, provocative fashion. As he approaches his 80th year of discovery, we wish him continued success in awakening our thoughts to the miracles of the nature of things. This entry was posted in Culture, Religion and tagged age of Earth, David Suzuki. Bookmark the permalink.